A public broadband informational meeting. 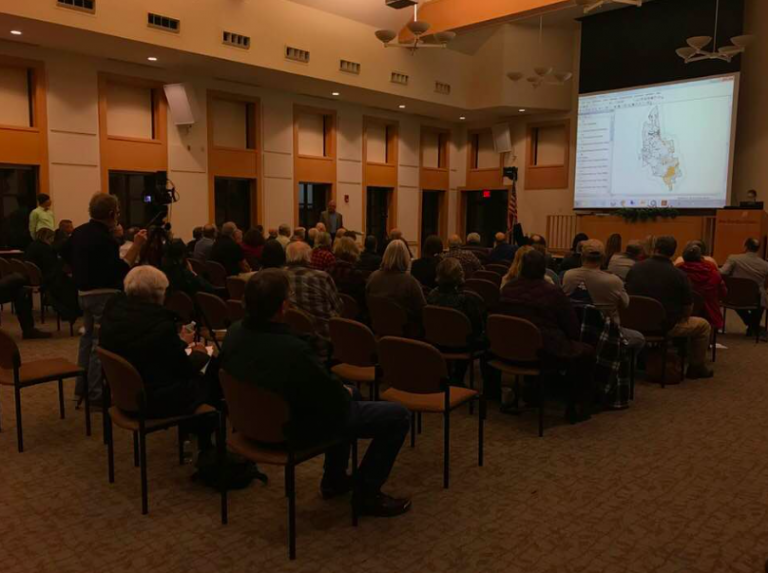 JAY - Officials from four different towns came together last night to discuss the ongoing, county-wide broadband initiative spearheaded by Greater Franklin Development Council. The project aims to bring greater connectivity to the county, with the long term goal of providing a more desirable home base for potential new businesses or residents. "If opportunities for internet increase, the population would then hopefully increase which would push down taxes for everyone," Greater Franklin Development Council Executive Director Charlie Woodworth said. Woodworth and project consultants fielded questions from select persons and town managers from Wilton, Jay, Farmington and Livermore Falls. "It was a great meeting. People were really seeing the benefits of doing this on a greater scale," Woodworth said. The "greater scale" of the project would include participation from all 22 towns throughout the county- a partnership that has been established since the fall. By focusing on a regional effort, rather than a town-by-town basis, costs will be kept down and more potential providers will be attracted to the project, according to Woodworth. Each town will have the opportunity to weigh in on the design of the project in their particular area- meaning costs could fluctuate greatly depending on decisions of where to extend the broadband offerings. "Wilton, for example, has a lot of outlying areas that are only occupied by camps, or not occupied at all. If they wanted to, they could decide to offer cable broadband in the more densely populated areas while only offering DSL to those outlying areas," Woodworth said. The project is a unique one to the state, and has already caught the eye of ConnectME and USDA Rural Development. Woodworth said while other similar initiatives have taken place in the state, the Franklin County has already been successful due to the team mentality of the 22 towns. "We learned from those who went before us. We heard a lot of common faults- they had a beautiful plan and great data, but no engagement from the towns. Convincing the towns that this is important is mandate. It takes time, but now we have 22 towns that are all swimming in the same direction. They want to see this move forward," he said. The next steps for the initiative will be to continue meeting with the six to nine providers that have been identified as interested in participating. Each provider will be asked to make a proposed solution to the team which will then be examined and narrowed down. For more information on the Broadband Initiative click here or here. For questions email Charlie Woodsworth at cwoodworth@greaterfranklin.com. Why does Mr. Woodworth assume the people who live here desire more people living here? If you want Massachusetts internet, move to Massachusetts. At the end of the day people are going to live where they want to live. These high speed internet options are available, but people here won't or can't pay for them. Ask the providers how many subscribers already under subscribe for the service. Whats next county wide water and sewer? Public transit? Well, we already have a Subway. I don't even know what it is so I don't miss it. "If opportunities for internet increase, the population would then hopefully increase which would push down taxes for everyone," Greater Franklin Development Council Executive Director Charlie Woodworth said. " I think it would be great for the community to have the choice of better internet, but can anybody possibly believe that this will result in lower taxes? If so maybe the GFDC could have provided some examples. @ Nerf: "If you want Massachusetts internet, move to Massachusetts. " Yes, if you want If you want Massachusetts lectricity, move to Massachusetts. If you want Massachusetts plumbing, move to Massachusetts. Progress bad. Horse and buggy, good. @ Stan Jonathan Quite a leap in logic. This is a typical liberal idea. We have decided there is a "need" and we are going to confiscate your earnings to pay for it. It is very expensive to build infrastructure, if the money was there to recoup the expense it would already have been done. The issue I have is using tax money to build an obviously not profitable enterprise on the fairy tale idea it will stimulate growth and tax revenue. I do believe satellite internet covers the entire county. I don't expect Peter Lugers to open a restaurant in Farmington, why should I expect my neighbors to pay for a fiber network to my home? It wont and they cant, But from an altruistic viewpoint it should...Meaning some business WOULD be able to move here and more people doing work remotely COULD choose to move here, So if incoming taxes to the county/state came in and they didn't spend it as fast as they take it in and if it wasn't being spent to pay on the bonds required to lay the lines down in the first place then taxes SHOULD decrease. My family and I would benefit greatly from increased speeds...However, paying for any of this with taxpayer dollars is not a good solution, the ISPs will make money off this for the rest of eternity while taxpayers will be paying for it just as long. They will eventually want the market share and someone will run lines but it will be a long time and longer if state and local governments elsewhere keep paying for their infrastructure for the companies. Would anyone support using taxpayers money to buy tow trucks or trash trucks for a private company to reach more customers? As stated I don't like the idea even though it would benefit my family. I pretty much agree with what you say here, except "these highs peed options" you speak of don't exist everywhere. If you run a business or work remote and need the ability to transfer large files- you are limited on where you can live up here. The water/sewer question has already been answered, most towns have people not connected to either system paying taxes to keep those systems running for the ones who do use them. Yeah let's put up more high power towers so we can continue to microwave our population. Look at stats of areas that did this and the cancer rate explodes. Breast cancer, lung cancer, brain and blood cancers all skyrocket in these areas. Don't come to one of the least populated states if you want a lot of company. No thanks. Microwaves from cell towers and broadband towers are linked to many types of cancer. I don't know about some but I am sick of hospitals full of cancer patients. This is an infrastructure investment, kind of like fixing the potholes in the road. This means we share the cost and we share the benefits. Maybe none of you needs this personally, but let’s just say this investment will keep 20 kids in Franklin County instead of forcing them to pick up and move south. 20 kids stay here, open businesses, start families, etc. The tax base increases because of this because these kids and their families and businesses contribute to the community. We cannot survive in Franklin County if the only people who live here are grumpy retired folks with fixed incomes. We need the young to stay, and if a little shared investment means they will, then let’s do it! so...what are we looking at for project costs? Think of it like when electricity was brought to every home last century. That meant putting up a lot of poles, wiring, and the like. I'm sure there were some who thought it wasn't worth the money, or the ugliness of electric wires everywhere just to have this new fangled source of power come to everyone's home and business. Yet what had been a new luxury quickly became a necessity - who would start a business or move somewhere that didn't have electricity? This is the 21st Century's necessary technology for any business, for people who want to work from home at least part time (which is becoming a lot more popular), and to keep up with the rest of the country. Of course, the concerns about companies profiting and what the tax payer has to pay are legit. But one way or another, we need a modern infrastructure. Pure, I am beginning to really look forward to and enjoy your comments. Both of us know that if this company had evidence or proof of taxes being reduced it would be front and center on their Powerpoint presentation. The word they use is " hopefully ". Sabine, I am an old grumpy retired folk and have no problem with technology or building for a better local community. And I also don't mind investing in it knowing that in my lifetime I won't see the return. But when large companies tell me it will reduce my taxes, I say show me. These companies are for profit, I understand that and they provide a much needed service for many, both on a business, and personal level. But let's call it what it is. People have survived in this county for many years. Please don't pick on the old folk that have worked so hard to make it what it is and I will try not to pick on people that eat tide pods. Scott, just so you'll know, Farmington area DID NOT have power because the tax payers paid for it. Nor did they have phone paid for tax payers. The companies paid for putting up their own poles and lines. In fact, the Normal School was one of the first places to have electricity in 1887, right after the fire in 1886. Phones did come in here shortly after, and the town's complaints were too many poles - Dirigo PHone Company was first, followed by Maine Tel & Tel. Then The Farmer's Coop phone company moved in. They were competing companies and they had no reciprocity. The some businesses advertised "Both Phones". They ironed it out eventually, but initially there were problems. And double poles. Farmington Light and Power, later Maine Consolidated ran power lines all over the county. Not one tax payer paid for it. And not everyone had power. People got power when they paid for wiring their home and the lines were then run to their houses. Outlying areas were not lighted by power - some as late as the 1940's. The company ran the line when they had enough subscribers. just like some cable companies now. I'm like BillyJoeBob. Grumpy old person, who has paid to make this area what it is today. Only to be challenged by people who look down their noses at us old people, like we should put up, shut up, and pay more. And the school is no exception. Why not sell shares in a company and then those that want to contribute could possibly recoup their investment.No one should have to pay for this they don't want or use.People could come in board when they feel the need or not. "I'm like BillyJoeBob. Grumpy old person, who has paid to make this area what it is today. Only to be challenged by people who look down their noses at us old people, like we should put up, shut up, and pay more." They sure can learn from some experts on how it is done!